You guys Eve is going to be one year old on January 23rd! Wha?!? Who said "the days are long, but the years are quick?" They were totally right except they should have said the nights are long but the years are quick. Sleepless nights with babes are no joke. But Eve has actually been a much better sleeper than Flynn. Queue the "thank heavens" emoji. So rewind a bit. 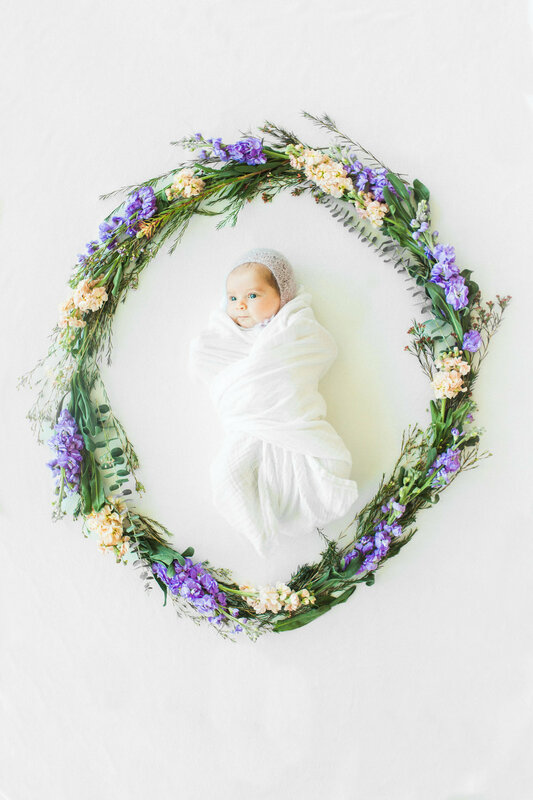 When Eve was about a month old, Breanne from Red Poppy Photo came over to take Eve's newborn pics. Breanne is just amazing. She did Flynn's newborn pics as well. I still have never shared them. I will have to do that. He's only two. Oh man. I am a hot mess over here. So because I am totally sentimental over the fact that my baby girl is going to be one, I thought I would share her newborn photos. 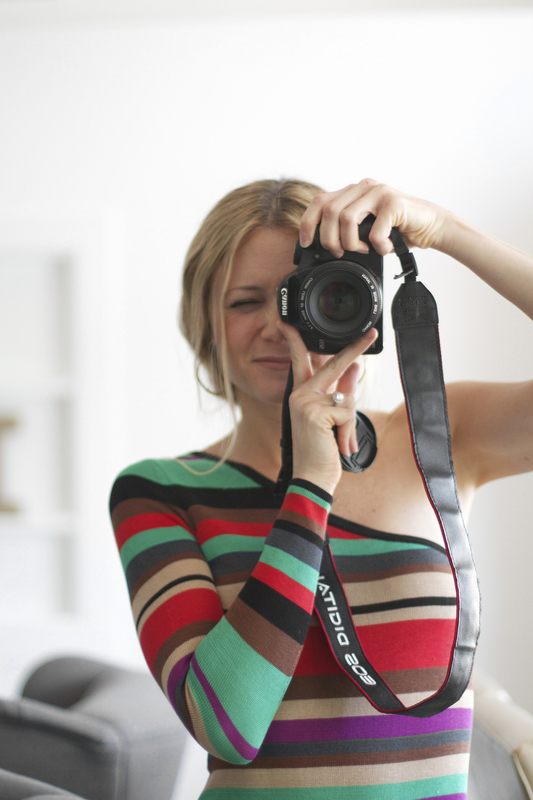 I also created a little behind the scenes video from our photo shoot. Check out the end of the post. If you are on the fence about doing baby photos, I highly recommend them. It's just so fun to look back at their newborn pics and see how little they were. Eve is much chubbier now than she was in these pics, but she isn't quite as chubbers as Flynn. I secretly hope she gets there. Chubby babies are just so scrumptious. I am having so much fun with a girl. There is absolutely no way to predict it naturally, so don't ask me why ... but Mikes and I always thought we would have all boys. So at first neither of us knew what to do with a girl. Again, don't ask me why because I am a girl. IDK just hang with me here. My point is that we are super excited to learn all of these fun new things with a girl. I am already loving picking out outfits for her. The Target girl section is just so much better ... amiright?! BUT I haven't forgotten about this cutie boy. He holds such a special place in my heart. He kind of stole the show at our newborn photography session. One and a half year olds just have a lil more personality than newborns. He is at such a fun age. The new things he comes up with on a daily basis crack me up. This photo might be my favorite of the bunch. I love Flynn man's expression. I see this excitement for Evey on a daily basis. He loves gettin him some Evey. Look at all that hair! I don't know if the old wive's tale is true that babies in the womb with a lot of hair cause heartburn, but I had some screaming heartburn with Eve and Flynn ... and they both had a full head of hair when they were born. So I'm betting on that old wive's tale. Love this sweet moment of Evey girl and me that Breanne captured! Oh man when big brother smiles it absolutely melts my heart. And talk about melting my heart! I love when Flynn kisses Eve unsolicited. I made this headband you see here. It's a super super simple DIY. I took a crocheted flower from another hair bow I have and hand-stitched it onto an elastic band. Then I wrapped the elastic band around Eve's head for a measurement. Finally, I cut the band and hand-stitched it together in a circle. It takes all of about 10 minutes. I wanted something delicate. so this was exactly what I was looking for. Flynn did really well at the photo shoot. I think it helped that we were home, so he wasn't wanting to run around and check out his new surroundings. You might want to consider staying home for newborn pics. Your other kiddos might cooperate more, and as you might know, it's not always easy getting out with a newborn. Also when booking your session, you might consider that you may still be healing from the birth. OMG she is just so tiny here! I just LOVE this pic of Mikes and Flynn man. I've got to frame this. These two are so cute together. They have a nightly session just like. They play in our bed, and Flynn just cracks up the entire time! I love her lil smirk here. Raise your hand if you're a sweet lil cutie. Her gestures crack me up sometimes. Unfortunately, lately one of her gestures is to smack me right across the face. She thinks it's so funny, and I have yet to figure out how to get it across to her that we don't wail on mama. Any ideas? Our first family photo of all four of us! This one of Flynn makes me smile every time I see it. He is an animated lil buddy. There you have it! Hope you like Eve's newborn pics. In case you are interested, here is her birth story. Let's just say it went a wee bit quicker than Flynn man's birth. I also created a behind the scenes video of our photo session. I hope you like it. If you want to check out all of my videos, make sure to follow me on YouTube. Click the button below.